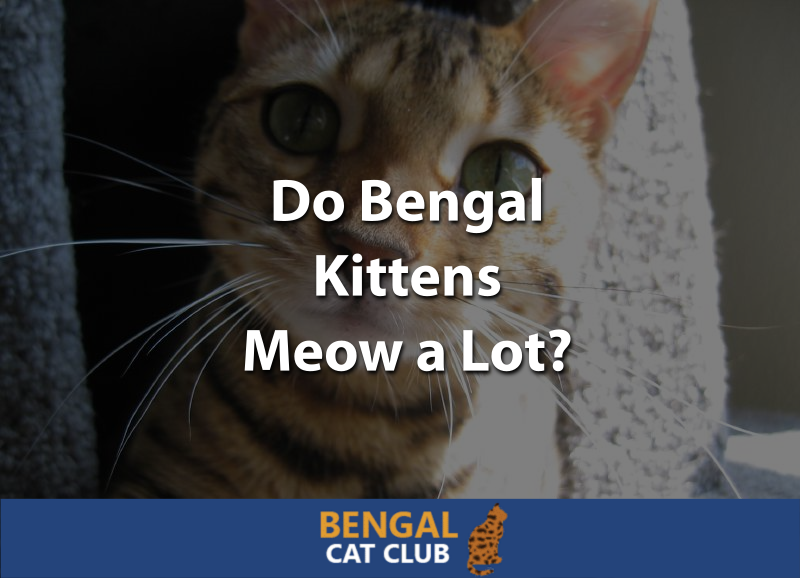 » Do Bengal Kittens Meow a Lot? If you are looking into getting a Bengal kitten or already have one, you may be asking the question “do Bengal kittens meow a lot?” Since excessive meowing can be annoying, it’s a good thing to know before getting a kitten that will end up driving you crazy. The truth is that most Bengal kittens do meow a lot, and we’re going to get into the reasons why, and show you what to do about it. Do Bengal Cats Meow a Lot? Why Do Bengal Kittens Meow a Lot? Bengal kittens do meow a lot. The average Bengal kitten will meow much more often than other cats. Although there’s usually a good reason behind it, there also may not be. If you can find out why your Bengal kitten is meowing, then you can work quickly to solve the problem so they won’t be meowing anymore. However, if you can’t discover the reason and the meowing seems urgent, then you may need to take your kitten to the vet to see if there’s something wrong with them. Not surprisingly, most Bengal cats will meow a lot as well. Some may even meow more as they grow into adulthood. For this reason, if you are easily annoyed by an overly-communicative cat, then it’s best you consider a different breed of cat. Bengals make it hard for you to ignore them and their needs. There are a number of reasons that your Bengal kitten may be meowing, but we’ve just picked out a few to discuss. All of their meows will sound different depending on why they’re meowing, so figuring out which meow it is will help you know exactly why they’re meowing. Little kittens have little tummies that need frequent filling, especially since their body is doing a lot of growing and changing. For that reason, Bengal kittens should always have access to a high-quality, grain-free kitten food so they can eat whenever they get hungry. If the food does run out, they will start meowing. All that dry food can make a kitten thirsty, especially if it’s a cheap brand of cat food that’s filled with salt and other preservatives. Like food, your kitten should always have access to clean drinking water so they can get a drink whenever they want. If they do need water, they’ll certainly let you know! Bengal kittens tend to be much more social than other breeds, so if your Bengal kitten isn’t getting the interaction they want, they may start to meow. Sometimes, a kitten may do this when you first bring them home if they miss their family. After you’ve had them for a while, though, they will start meowing when you aren’t giving them enough attention! In the midst of play, Bengal kittens will make a wide variety of noises, but they will also meow when they are simply feeling playful in order to get you (or someone else) to play with them. This is similar to a cry for attention because they’re looking to interact with you. Like many other cats, Bengal kittens don’t like when they don’t have a clean place to go. If their litter box is dirty, you may find them meowing around the house to let you know that something needs to be done about it. You should consider this type of meow a blessing, though, since their other option was to simply go somewhere else. Kittens only have one way to communicate their needs to you, and that’s through meowing. So, if you kitten is in pain or simply not feeling well, they may start meowing. If you can’t find any other reason for their meowing and you notice anything else unusual about your kitten’s behavior or body, then you should take them to the vet immediately to make sure it’s nothing serious. Now that you know some of the reasons that Bengal kittens meow, you can find out what you need to do to keep them from meowing all the time. Although there’s no way to keep your Bengal kitten from meowing at all, it is certainly possible to limit the amount of talking they’re doing throughout the day. The best way to do that is to figure out what they’re meowing about, then meet that need. If your Bengal kitten is meowing because they are hungry or thirsty, then you’ll want to make sure they have access to food and water. If you’ve recently moved their food or water bowl, then they may have trouble finding it, so make sure they know exactly where their food and water bowls are. You’ll also want to make sure the bowls are in a location where the kitten feels safe, since kittens naturally will avoid eating when they’re nervous. Busy areas of the house or places where other animals frequent may make it difficult for your kitten to settle in and eat. Try moving your Bengal kitten’s bowls to a quieter area of the house if they seem to be crying from hunger or thirst yet have both food and water. Bengal kittens need high-quality, grain-free kitten food to meet all their nutritional requirements. Check out our list of best dry cat foods for Bengals if you’re not sure what to get for them. You may also consider offering wet food to pique their interest if they don’t seem hungry. To make sure they always have clean water that they’ll be excited about drinking, consider getting your Bengal kitten an automatic cat waterer that will ensure their water dish never goes dry again! If your Bengal kitten is looking to interact with you, do it! Sometimes, your kitten may just want a snuggle, so you can pet them and give them a good scratch behind the ears. They’ll be sure to love it. Another great way to interact with your Bengal cat in this way is to brush them. It will help reduce shedding and increase your bond. When your Bengal kitten is looking for a way to play, make sure they not only have a great selection of toys to choose from, but that you’re there to play with them as well. Laser pointers and cat dancer toys are both great ways to interact with your Bengal kitten. This one is obvious, but we’ll say it anyway. If your Bengal kitten is meowing because of a dirty litter box, clean it! It’s important to have a good litter box for your Bengal and to be using the right kind of litter. Then, make sure you’re keeping it clean so that they don’t have to worry about stepping in an old mess when they need to go. If you don’t like cleaning out litter boxes, then you might try training your Bengal to use the toilet. This way, all you have to do is flush when you find a mess, and there will be no more litter tracked all over your house. Although it takes some work to train them, it’s definitely worth it! Another option for avoiding having to clean the litter box is to get a self-cleaning litter box that makes it quick and easy to clean. Sometimes, you just can’t figure out what your Bengal kitten wants with all their meowing. If you’ve already made sure they have food and water, interacted with them, and cleaned out the litter box, it might be time to take a trip to the vet. If your Bengal kitten is crying because they are in pain or sick, then only your vet will be able to figure out the solution to help them feel better which will in turn keep them from meowing so much. So, do Bengal kittens meow a lot? Yes, but there’s usually a reason behind it! Finding out the reason behind their cries will help them and you, so don’t just get upset with them. Do some detective work and be willing to figure out what your kitten needs. Here’s a tiny Bengal kitten talking to their mom! It’s pretty obvious where they get their talkative nature from. What about you? Do you have a talkative Bengal kitten? Tell us all about your friendly feline in the comments below! We’d love to hear from you!